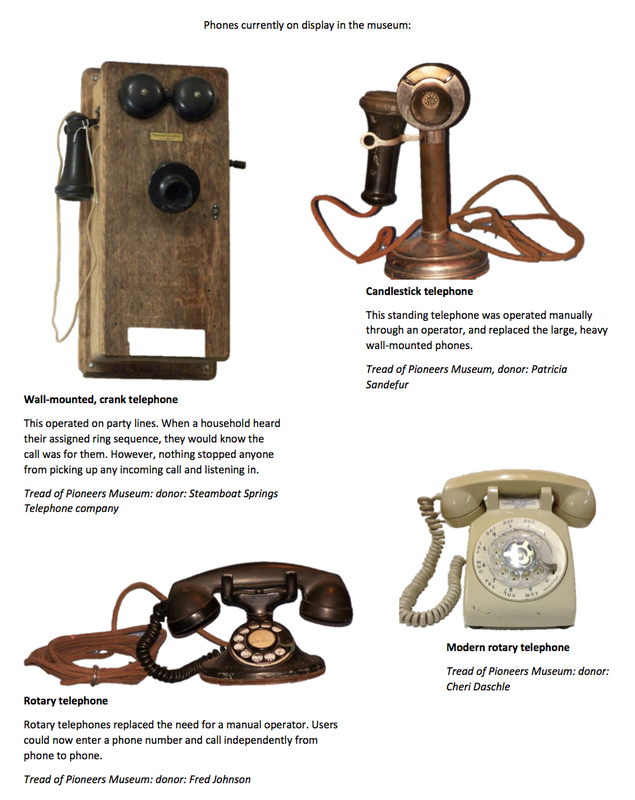 A collection of antique telephones at the Tread of Pioneers Museum reveal the history of telephone service in Steamboat Springs. Telephone service began in 1900 when Steamboat Springs, about 25 years after the town�s founding by James H. Crawford.. A long distance line was connected Rifle to Steamboat Springs in October of 1900. According to the Routt County Sentinel article below, Northwest Colorado was �being put in touch with the outside world.� Wealthy cattle companies like the Cary brothers of Hayden funded lines which were strung from ranch to ranch and to railroad shipping points. These early telephones were battery and crank operated, and worked on �party lines.� Each ranch house was assigned a ring sequence. When the residents heard their ring, they would pick up the call, or pick up any call they wished to listen in on. In Steamboat Springs at this time, there was one battery operated, wall-mounted, crank telephone in town that was located inside the J.W. Hugus Store on Lincoln Avenue. Those who wished to make a call had to wait in line. Because few homes could afford telephones, general stores often had one installed for their customers. The telephone operators, a job held predominantly by women, were in charge of connecting all local and long distance calls. As the population of Steamboat Springs grew, letters were added to phone numbers. For instance, Dr. Crawford�s office was 51W and 51J. The Dentist, Dr. Schneider was phone 148 J. The letters represented party lines, which made connecting the lines easier for the operators. Next came rotary dial phones. While the rotary dial technology was developed in the late 1890s, it was not used in Steamboat Springs until April 1962 when the change from operator-assist was made. (Yampa and Clark had had dial service for a few years prior.) According to Steamboat Pilot reporter and local historian, Dee Richards, the six-story micro-wave tower was built at 7th and Oak Street with a large micro-wave relay facility at the top of Mt. Werner in the early 1970s. �This replaced all of the land lines which had, through three quarters of a century, been the only means of sending telephone signals from phone to central office to receiver.� The tower remains on Oak Street today. Touch-tone (push-button) phones eventually replaced rotary dial phones. The local phone company, once located in today�s Beau Jo�s Mountain Bistro, closed its local office sometime in the 1980s. Steamboat is Now in Touch With the Outside. Branch Line Will Be Run to Hahn�s Peak and the Main Branch May be Extended to Wolcott and Other Places. There is not only a prospect of Northwester Colorado being put in touch with the outside world, but the thing has really occurred, in the shape of a long distance telephone line that connects us with every point of interest in the state. Where formerly it took nearly a week to do business with the nearest railroad point, or Denver, the same work can now be done in fifteen minutes. From a business point of view it is a great benefit and advantage to Steamboat Springs and the entire county. The line was completed Tuesday evening and everything put in running order between here and Rifle, on the Denver and Rio Grande, where the line will connect with that of the Colorado Telephone Company. From Steamboat Springs the company will run a branch to Hahns Peak, which may later be extended to Battle Lake and other points north. There is a movement on foot to have the line continued to Wolcott, and for that purpose already $1,500 has been subscribed by some people. The line to Wolcott and Hahn�s Peak will likely not be built until spring. The subscribers to the Wolcott-Steamboat line are F.A. Metcalf, F. E. Milner, D.W. Whipple and Chas Seymour. 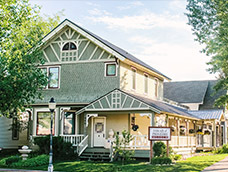 The company putting in the line is known as the Western Slope Telegraph and Telephone company with some of the most prominent and substantial men in the state connected with the enterprise. The promoters are Fred S. Rockwell, George W. Ballantine and George W. Vallery of Denver: Jack Felser of Glenwood Springs, and J.C. Davis of Rawlins, Wyo. Stations between Steamboat Springs and Meeker have been placed as follows: Milner ranch, Hayden, Cary Ranch, Craig, Wood Ranch, Axial and Hamilton.